from the sheer beauty, the investment value is tremendous! #94 of only 140 in the world! Brass Plaque with the legend "New York Fifth Avenue ~~Thomas Kinkade"
START A THOMAS KINKADE NEW YORK COLLECTION! Since 9/11 there have been a surge of requests for scenes of Manhattan. Even those who have only visited New York once or twice, want a artwork of the Big Apple. Thomas has a great affinity for the Big Apple and has painted several New York (Manhattan) scenes over the years. THIS ARTWORK IS FOR THOSE WHO HAVE AN AFFINITY FOR THE 1930S AND 1940S. GO BACK IN TIME TO THAT ERA! This edition has been sold out for many many years and is no longer available in the galleries or from the publisher. Now only found in private collections. 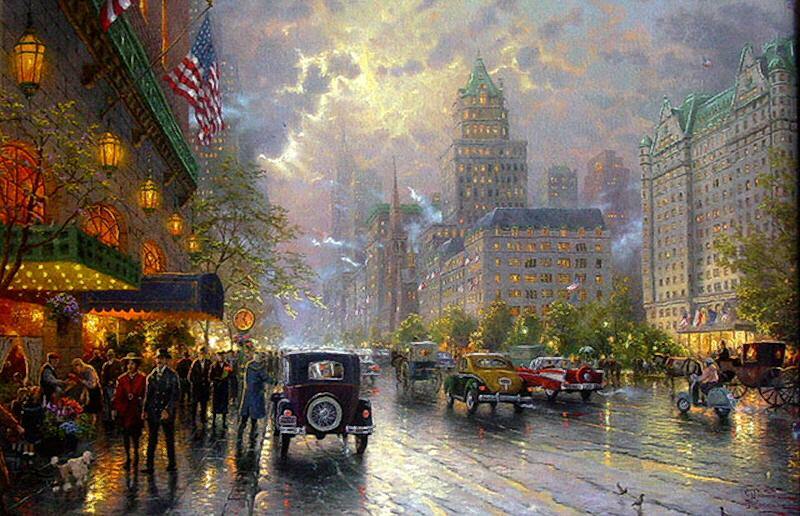 New York Fifth 5th Avenue is yet another of Thomas Kinkade's popular New York themed artworks. See above of others. 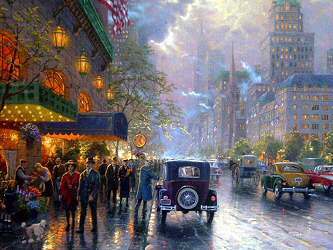 Visit my eBay Store for these and other great Kinkade artworks! ++++ RARE! This edition was limited to only 140 in the world! ++++ 18" x 27" CANVAS Framed af approx 28" x 37" Premium Studio Proof frame which has a value of $495.00 retail ~~ ready to hang! (was issued only in one size) framed in a approx 28" x 37" Premium Studio Proof frame which has a value of $495.00 retail ~~ ready to hang! 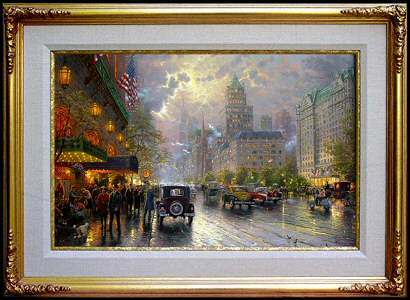 ++++ Brass Plaque with legend "New York Fifth Avenue ~~ Thomas Kinkade "
++++ Hand Signed by Thom the front of canvas in GOLD! 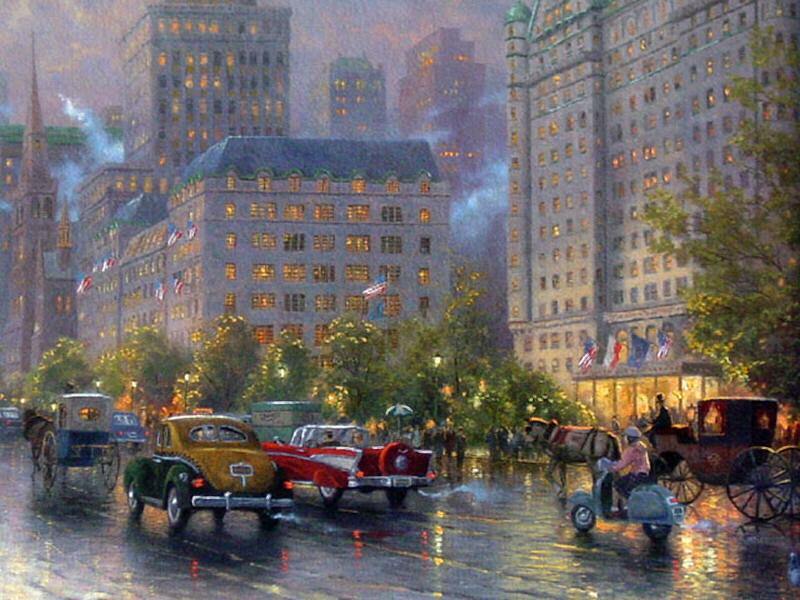 ++++ Theme ~~ New York's 5th Avenue,( going back in time) Vintage cars. "Now, more than ever, New York is "America's City," a symbol of our indomitable spirit, our energy, our roots in a proud past, our confidence in the future. Is there any place in this fair land that better symbolizes the glamour and drama of American life than NEW YORK, FIFTH AVENUE? New York is the most theatrical of American cities. As I assembled my sketches and impressions of historic New York City in my studio, it occurred to me that an artist is in the same position as a theatrical director. Like a director, I can assemble stage settings that combine reality and imagination to evoke the mood, the feelings, the special character I hope to convey. That's just what I've done in NEW YORK, FIFTH AVENUE. Here is the Plaza Hotel and the great historic buildings of Fifth Avenue; here the lavish foliage of Central Park. Looming over all is the magnificent guard of the Empire State Building, which stands as a prideful symbol of the commercial might of this great city. I've intentionally made this a timeless image of New York, as two-wheeled hansom cabs and classic American automobiles patrol the busy streets. The essence of the great city, as the essence of the country it so nobly represents, remains the same throughout decades past and into the future."